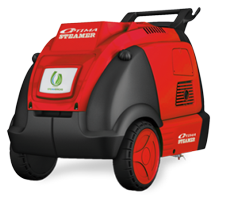 The Optima Steamer comes in two diesel powered models - the Optima DMF Steamer and the Optima DM(S) Steamer. Equipped with a diesel powered burner, they produce steam within 2 minutes, automatically turning on and off to maintain operating pressure. 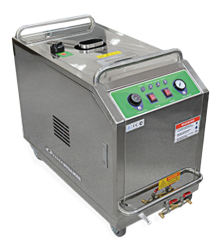 The non-idling burner allows the machine to minimize emissions, noise and fuel consumption. The dual spray gun system enables two operators to clean simultaneously without loss in steam pressure. The moisture level of steam can be adjusted accordingly, based on the cleaning application. For example, dry steam would be used for car interior cleaning, and wet steam used for a heavily soiled truck exterior. The 33ft-65ft (10m-20m) hoses give operators a wide range of movement for added convenience. Designed with safety and ease of use in mind, the diesel powered Optima Steamer contains multiple safety features as well as an automated monitoring system to let the operator know when water or fuel are running low. The Optima DMF is ideal for mobile cleaning operations including mobile auto cleaning and commercial cleaning. Customization and private labelling available pending minimum order quantity. The Optima DM(S) has an industrial stainless steel frame and is ideal for any automotive, commercial, industrial and processing facility cleaning.